Yes, there is a jet ski weight limit, and yes you should avoid going over it. The weight limit on a jet ski is all the passenger’s weight along with everything you carry in the storage compartment. Weight limits range from about 350 pounds to 600 pounds. That’s approximately 160kg to 272kg for our European friends. We want to talk about why this limit exists, give you a list of all 2018 weight limits, and why you should avoid going over it. Yamaha VX ??? Guessing 600 lb? Yamaha VX Deluxe ??? Guessing 600 lb? Yamaha VX Cruiser ??? Guessing 600 lb? Yamaha VX Limited ??? Guessing 600 lb? Yamaha VX Cruiser HO ??? Guessing 600 lb? Yamaha VXR ??? Guessing 600 lb? Yamaha FX HO ??? Guessing 600 lb? Yamaha FX Cruiser HO ??? Guessing 600 lb? Yamaha GP1800 ??? Guessing 600 lb? Yamaha FX SVHO ??? Guessing 600 lb? Yamaha FX Cruiser SVHO ??? Guessing 600 lb? Yamaha FX Limited SVHO ??? Guessing 600 lb? Please don’t confuse the weight of the watercraft with its weight limit or weight capacity. The weight of the watercraft is how much it weighs, but the weight capacity is how much it can hold. I could not find an exact number on some of the Yamaha’s so I gave an educated guess since the closest competition is at that weight limit. I’m often surprised by other jet ski rider being so care-free with the weight limit. It’s there for a reason and is not a suggestion. When you get too much weight on a jet ski, it becomes unstable. When you have an unstable watercraft, it’s harder to control especially at lower speeds where you need the most control. This all leads to it being dangerous around the docks. 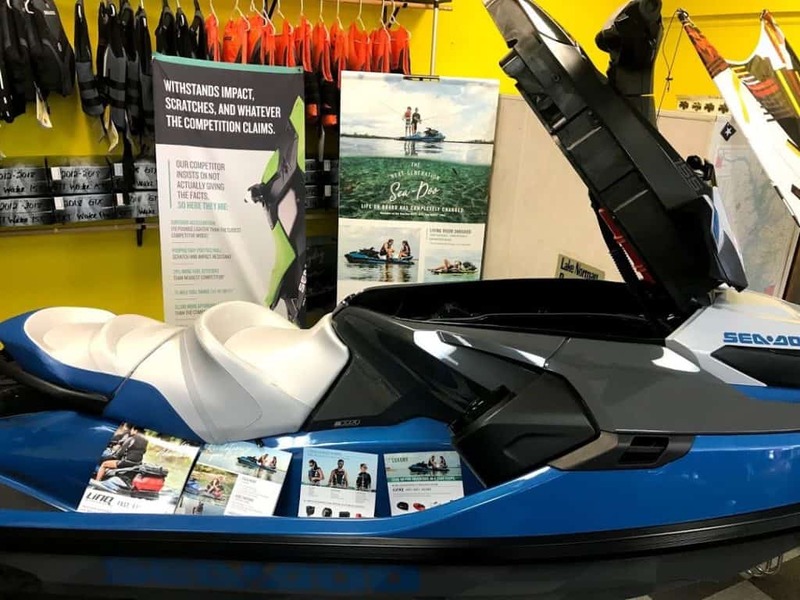 Often the lowest weight limit watercraft is also going to be the cheapest while the more expensive ones are going to hold more weight. The Rec-Lite and Recreational categories of jet skis are going to have the lowest weight limit. While the Luxury models are going to have the highest weight limit. The lowest seat capacity jet skis are going to have the lowest weight capacity. I have a saying, if it’s a 2 seater then it’s really a 1 seater and if its a 3 seater then its really a 2 seater for “normal” sized adults. You start noticing my saying more and more when you look at the brochures and advertising as they often only have 2 adults and one child riding. You never see them with 3 grown men riding a tiny Spark or EX because it’s just not possible. Yes, it can be done, but you risk safety, and you’re going to end up in the water if you have 3 grown big men on a tiny jet ski. Sure, it sounds funny but don’t do it. 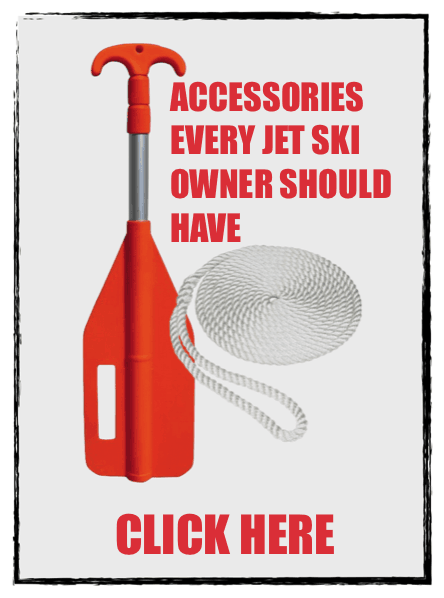 Tip: Most jet skis have a rear grab handle for your passengers to hold on to. I’m a 240-pound man, and I feel very confident riding a 3 or 2 seater spark by myself. I’ve even ridden two of me on my 3 seater spark, it’s possible, and no one fell off. But I would not dare put any more weight beyond that. I’ve also ridden 2up on a 3 seater GTI and had no issues with that; it felt a lot more stable than the 3 seaters Spark that is for sure. If you’re concerned about weight, you’ll want to stick to the bigger models. These bigger models are for example the FX series from Yamaha, GTX or RXT from Sea-Doo, or Ultras from Kawasaki. 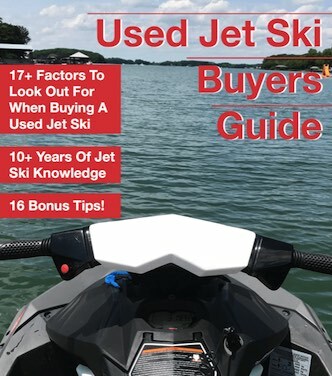 If you’re new to jet skis but still want something that’s easier on the pockets I recommend you check out my post on the best beginner jet ski. And no, it’s not a Spark or EX that I recommend. First off, let me state I’m not a doctor. Second, you need to be aware that it will require a lot of strength to pull yourself out of the water if you fall off. Kind of the feeling when getting out of a pool from a ladder, you’re waterlogged and is much harder then it seems. Then on top of that, you’ll have to balance on the jet ski to get back on top. Third, make sure the watercraft has some ladder on it as this will make getting back on easier. And fourth, be aware of the weight limit of the machine. Most watercraft now have a weight limit sticker usually located on the side of the watercraft. With the average weight limit around 600 pounds that is going to be hard to reach by one person. You could have two grown men at 250 pounds each with room left over for 100 pounds of gear and fuel on the bigger models. One more thing, keep in mind the seat height. I’ve noticed that suspension models give the best ride, but they can also have the highest seat height. The higher you are, the more top heavy you become. Top heavy means you’ll be unbalanced at lower speeds.